The fact that I needed a new antenna system became really apparent during the 2003 San Diego Cedar Fires where my then existing antenna systems just did not work. On September 29, 2004, Dr. Don Compton, KG6NDX and I were invited to address the San Diego County Counsel on the failure of the government communications and the vital role we Hams played in saving lives during the 2003 Fire Storms. California Forestry Department Battalion Chief Murphey stated that the only reliable emergency communication in the county, if not the state, is that provided by Amateur Radio. Everything else is prone to failure. And yet there I was with only dipoles at 38' which blocked by the terrain. Who knows how many more lives could have been saved if we had had better communications? 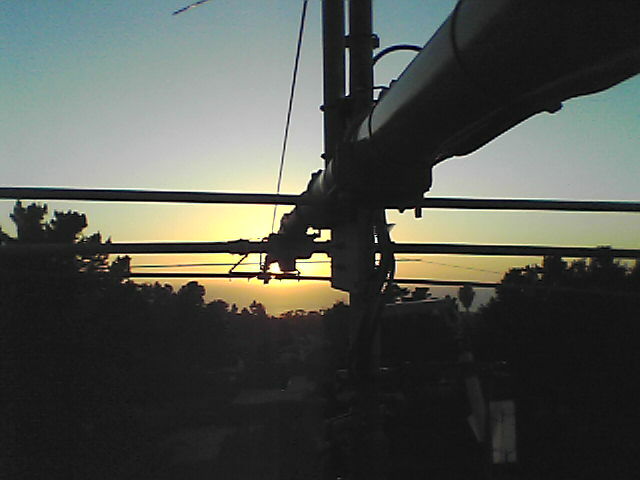 Its been twenty years since I last had a beam on a tower.... so after 20 years of agony with a dipole, I decided that I really needed the best antenna money could buy so that I could provide San Diego with a vital amateur radio emergency station. After far too much research into antenna systems, I decided on the SteppIR design. which is effectively a monobander on every band....now I never use 40 M except for Emergency Communications but when they announced a 40 M version, I had to have it.. you never know.. I might just start working 40M for something other than emergency traffic... I decided on the SteppIR MonstIR which is 3 Elements on 40M and 30M, 4 Elements on 20M, 17M, 15M, 12M and 10M and 6 Elements on 6M. I have always loved the excitement and challenge of working on the "Bleeding Edge" of Technology. It is an incredible feeling to be the first human to ever solve a problem....I know, I have been there a few times in my life...So I ordered the MonstIR in March 2004 before they had ever built one... I was on the list to get unit #2 off the assembly line. ... But in fact, I got MonstIR #1. - Yes, you heard it.. I got the first MonstIR ever shipped. MonstIR #1 Arrives 2.15.05 First Impressions - Wow is this thing BUILT!